In his previous life, Adam was the head of a Physical Education Dept at a Specialist Sports College in London. He travelled across the pond to marry the girl of his dreams and start a family. Adam still gets caught out with ‘English’ sayings and spellings but is loving life at the beach — always trying to use his accent to his advantage and his naivety as an excuse. Amazing. Crazy. Pinch me. It is true, right? Yep. The newest community on Gills Neck Road, Governors, opened in June 2018 with a grand opening on the Lewes Canal. What has happened since is nearly as amazing as the sun setting from the upper deck at The Wheelhouse that evening we celebrated the beginning. We are into the New Year and 2019 has not stopped the momentum at Governors! Location truly is everything. So why the blog? Well, we have hit a landmark quicker than any other new community in Sussex County. 100 new homes have already been chosen by their homeowners. We’ve added a sign on Kings Highway to highlight our sales, as I’m sure some people driving by think we’re still just starting. As it stands, close to a quarter of the community is sold already! The BIG message in this post is actually the biggest testimonial I could ever give you. We’ve even compiled a map to show you. The results are staggering on where our people are coming from to live on Gills Neck Road. If you’ve met me, you would have heard me talk about this already; but pictures are bigger than words! I’ve been in new home sales for 9 years now, and I’ve been lucky enough to work in a number of communities in the Lewes and Rehoboth areas for Schell Brothers. Many of those communities I’ve been extremely grateful to build from scratch. As is typical here at the beach, we get a lot of new homeowners from outside of Delaware. Due to low taxes, downsizing, a maintenance-free lifestyle and all that Lewes has to offer, this area is very attractive to buyers. We typically see a majority of peeps from New Jersey, New York, Maryland and Pennsylvania, to name just a few surrounding states that find their way to the beach. However, the majority at Governors is very different, and I truly believe that it is the only community I’m aware of where this has happened. 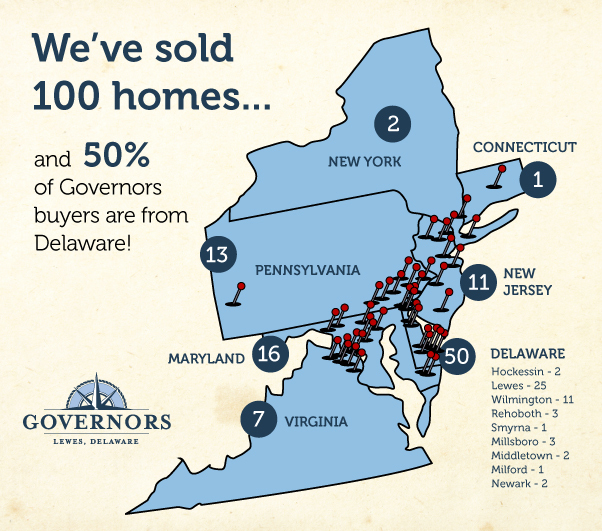 50% of our new homeowners are from the state of Delaware and 25% of the first 100 homeowners are from Lewes itself! Repeat: 50% from DE and 25% from LEWES! Staggering, right? It just doesn’t happen that way in other new home communities and yet it’s the biggest compliment to Governors. Local people in town and in the state who should know location the best are buying at Governors. Want to know why? Call me (302.228.2719) or email me (adam@schellbrothers.com) and let me tell you why all these people believe in Governors and Gills Neck Road living! Posted in Governors | Tagged Governors, Lewes, lewes delaware, new homes Delaware, new homes Lewes | Comments Off on 100 SOLD at Governors! How important is your road name in picking a new home? With our townhomes at Governors continuing to turn red on the site plan rather quickly, we have had to add two more buildings. By doing this we have added another road, and therefore another governor of Delaware, to Governors! The new buildings will contain pond home sites for the first time for our townhomes, as well as the possibility of being my landlord as we add to our townhome model collection. So let’s find out who the new guy on the block is. Framing underway in our new townhome building. Please welcome William Temple and Temple Road to Governors. Will was actually the youngest chap to ever be elected governor of Delaware. He moved from Queen Anne’s County, MD to Smyrna, DE and became a successful merchant. He entered politics in 1844. He also served in the Senate from 1845 to 1854. In May 1846, Governor Maull passed away and Temple, who was president of the Senate at that time, assumed the duties of governorship! So not quite planned as such, but you’ll take it right? During his tenure, the Mexican War had started and Delaware aided the war effort with supplies, men, and money. Temple also advocated to improve the state’s schools, taxes, and roads. He finished his term in 1847 and returned to the Delaware State Senate. Will was the thirty-sixth governor of Delaware and ninth individual person to assume the office of governor. There’s not much else to tell you about him really. He had a beard, was a fairly good-looking young chap, and his appearance was always up to scratch. He was married with three kiddos, so he had his hands full at home and at work. Anyway, back to the townhomes. Temple Road is pretty nice to print on your letters and envelopes, right? Governor Temple didn’t do anything terrible to the state, so you can be proud of your road’s name and history. Again, this will be the first time we’re offering pond views for our townhome units, which is super exciting! ALSO, we now have our FIRST TOWNHOME BUILDING under construction. The proof is in the pictures that I took for you all myself! Actually we are past the framing stage and so we can take people through both townhome units, the Tidewater (for the first time ever) and the Tradewind. EVEN BETTER we have four Tidewaters and two Tradewinds, so you are able to see different designs. Want to come for a tour? Schedule a visit with me or Natalie. This is the big one! No, it’s not the famous yo-yo move, but instead the big loop incorporating Gordon’s Pond Trail and the Junction & Breakwater Trail! There is NO better route to take in all the beauty surrounding us at the beach. The biggest problem you’ll encounter is, do you stop every time you see an amazing view to take a photo? Tough decisions right?! Ha. You can experience just under 16 miles of the best scenery around, and I promise there are numerous stops to hydrate, if you get what I mean. Here is the scenario. You went out last night to Striper Bites and had an amazing meal and drinks. Oh, it’s great to live close to so many amazing restaurants! You woke up in your new home at Governors and feel the need to work off all the goodies you ate. It’s all about balance. You plant the idea of a gentle late morning bike ride, including lunch of course. And just like that you’re out the door and seeking the trail! Jump on your bike, leave the community and turn right on the Junction & Breakwater Trail. Travel along the trail parallel to Gills Neck Road. Then, cross the road at the crossing just after the Hawkseye community. Continue on the trail and pedal parallel to Breakwater, then bear right and draw parallel to Freeman Highway (US 9). You will briefly join Freeman Highway and venture over the bridge, but keep cycling straight and then bear right onto Cape Henlopen Drive. If needed, stop number one is On the Rocks bar by the Cape May-Lewes Ferry. You can then enter Cape Henlopen State Park and get on the bike trail. This will take you by one of the watch towers which has an incline (pretty rare to find an incline amongst all of this flat land). You then wind down and go behind the camping area. The bike trail will connect to the walking dunes trail, which brings you to Dune Road in the park. You can take the trail alongside Dunes Road all the way to the Herring Point car park. This will lead you to Gordon’s Pond Trail. You can follow this trail from Lewes to Rehoboth. You’ll go past the watch towers, the Overlook (great spot for pictures) and then in the blink of an eye, you are in Rehoboth and leaving the park. You then connect onto Ocean Drive! Not a bad road name, right? In fact, isn’t that a song? Anyway, when you come to the junction you can either take Columbia Avenue all the way up to Grove Park in Rehoboth, or Henlopen Avenue. I actually think Henlopen Avenue is best. This allows you to take the small trail around Grove Park and come out behind the Rehoboth museum. From there, go over the bridge on Rehoboth Avenue, turn right on Church Street, and left on Canal Crossing Road. The second stop is available here to visit our friends at Revelation Brewing! It would be rude not to in my opinion, and that Cocoa-nut Joe Porter is just pure bliss. At the end of Canal Crossing Road, you have two options on Hebron Road to join up to the Breakwater Trail. Left or right you will end up on the trail, but it’s probably quicker to get off the road by turning left. You then follow the Junction and Breakwater Trail back from Rehoboth to Lewes and exit the trail into the Hawkseye community. Continue through the middle of the median on Golden Eagle Road and then follow the trail into the Senators community. You’ll come out parallel to Gills Neck Road, and home is in sight! Of course you could go past Governors, jump across the lights and pop into Big Oyster or Mr. P’s for lunch and a beer. Hey, you deserve it. You just did a little under 16 miles! You finish that route and tell me it wasn’t amazing and I’ll…eat my socks! Never in doubt and you will want to go again and again, and not just because of the stops you can make along the way. 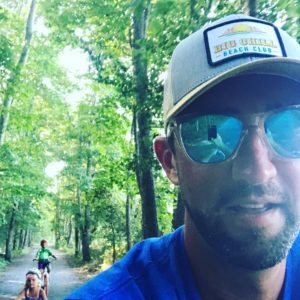 Alright folks, we’ve talked about peddling to get your coffee quick fix, a day trip to Cape May and how to cycle to the beach. Now we’re hopping on the bike and peddling just around the corner! Today is all about knowing where your ‘local’ is. I’m British, and everyone needs a ‘local’ – local pub/bar/drinking hole that is. Well, today’s route is going to show you exactly where the closest bar is to Governors. I must admit, living on Gills Neck Road myself, this place has been a true gift since it opened in late 2016. I’m a big believer in the quality of beer served, (obviously very important), but also great food and an all-around awesome atmosphere. And your soon-to-be closest peddle-to-beer location, Big Oyster Brewery (BOB for short), has all three covered. Okay, here is the scenario. It’s getting close to happy hour. You can decide what close is; I’ve found it can vary dramatically. It’s a beautiful day. Let’s be honest; we get a lot of those. And a little bit of exercise with a sizeable reward at the end is telling you to put on a sweater, get out, and get involved in ‘Lewes life.’ More than likely a new beer has just been canned by Big Oyster and you’re itching to try it at the bar, and then grab a four-pack to peddle home with. The best part is that BOB is only .6 miles away from Governors! Let’s get going then! We leave the community and turn left on the Junction & Breakwater Trail. We carry on the trail to the top of the road and cross over at the traffic lights. You can travel along sidewalk and the cycle line until you come to the shops including Mr.P’s Pizza. Then carefully cross Kings Highway and you are already at your location. Just like that! Ummm, super easy. That could be good and bad right? Ha. You have hit your destination of 1007 Kings Highway, Lewes, DE 19958! First of all, the exterior look of Big Oyster Brewery with the red barn and stone style is pretty fab. You’ll go in and find all kinds of amazing beers from sours to IPAs, stouts and more. My favorites are Deloris, Mischief Stout, Big Oyster Stout, Red Lips, Isabelle and that’s just the start. I like a lot of them. You can order up some oysters – they have a great variety – as well as lots of other fresh seafood. I really like the calamari at happy hour. Anyway, the whole place is pretty cool BUT you know what is the best? The bathrooms. 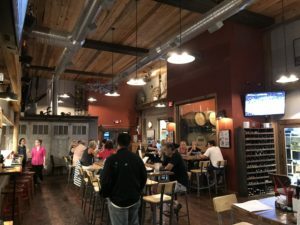 I know the outdoor area is pretty neat, the views into the brewery from the bar are always intriguing, the boat turned into pendant lights over the bar is cool, BUT the bathrooms are it! Trust me. Proper barn bathrooms and you’ll hear farm music. Yep, a dog barking in the distance and other farm noises. I just find that pretty cool. My old mum always said you judge a business by its bathrooms. Fins Restaurant Group and I’m sure Rebecca Fluharty, the local genius and designer who played a big part in it when she designed the building, killed it on the bathrooms. Anyway, always makes me smile. This place is truly a local gem. It’s so close that it may be dangerous, so be sure you make up for it with more of the amazing cycle routes from Governors. 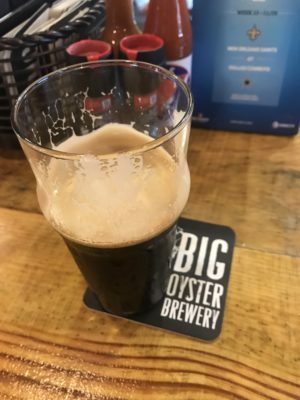 Cheers to Big Oyster Brewery becoming your local! Meet Jim and Julie, our newest neighbors at Governors! They currently live in the scenic Philadelphia suburb of Spring House, PA, and fell in love with Lewes for its history and small town charm. Read on to learn more about their family, and why they chose Governors. We’re so happy to welcome you to the community, Jim and Julie! Tell us a bit about yourselves and your current situation. 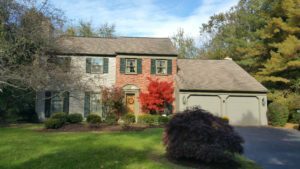 We currently live in a five bedroom colonial style home in a very beautiful development in Spring House, PA, a northern suburb of Philadelphia. We have lived here for almost forty years and have many friends and relatives near us. We’re in the middle of five suburban shopping malls, from King of Prussia over to Willow Grove. We can take the train from a nearby station into Philadelphia, for free, as part of being “elderly” in Pennsylvania. Our family is grown and doing their own thing. We have three children and four grandchildren. Our oldest granddaughter finished her graduate program in Art History and is working in Hawaii to assist the Duke Museum there. Our oldest grandson is in the Navy, currently in Jacksonville. A second granddaughter is in the corporate world, a business graduate of Duquesne University. The youngest grandson is studying Finance and Business at the University of Delaware, a Junior on full scholarship. Jim’s hometown is Beaver Falls, Pennsylvania and Julie’s is Abingdon, Pennsylvania. How did you hear/know about Lewes and the beach? We originally discovered Lewes in 2001 while vacationing in Rehoboth Beach. We are impressed with Lewes’ history and small town charm. Why did you pick Governors as your new home community? We chose Governors for its proximity to Lewes and the nature trail to Rehoboth, low real estate taxes, the great reputation of Schell Brothers, and the charm of our sales representative, Adam. Why did you pick your floor plan at Governors? We selected the Iris floor plan because we wanted to downsize, although we added a sunroom, (probably will add a patio), and we opted for a basement for a little extra space. What do you look forward to the most once you live in your new home in Governors? We look forward most to making new friends as we meet our neighbors and enjoying the beaches, Lewes and the nature trail. We also can’t wait to relax by the pool and hot tub! A day trip should always be in the cards. Don’t get me wrong; there is always something to do at the beach, but every now and then you should experience something new. Okay, here is the scenario. It’s a beautiful morning and you’re sitting on your courtyard sipping coffee. Life is good at the beach but an adventure is on the horizon today. No need to worry, as an adventure is only a stone’s throw away at Governors. Today we’re going to cycle on over to the Cape May-Lewes ferry. And why not? It’s only a little over 3 miles away! So jump on your bike! We leave the community and turn right on the Junction & Breakwater Trail. Travel along the trail parallel to Gills Neck Road. Then you need to cross the road at the crossing just after the Hawkseye community. Continue on the trail and pedal parallel to Breakwater and then bear right and draw parallel to Freeman Highway (US 9). You are then going to come off the trail at Monroe Street and join the Highway. If you don’t want to do that, (not that it’s super busy), then you can carry on the trail and go under the bridge, join Gills Neck Road, then turn right on East Savannah Road and go over the bridge. Ride to Lewes Beach but turn right at the Dairy Queen onto Cape Henlopen Drive. You’ll cycle past East of Maui and on the left will be the Cape May-Lewes Ferry. 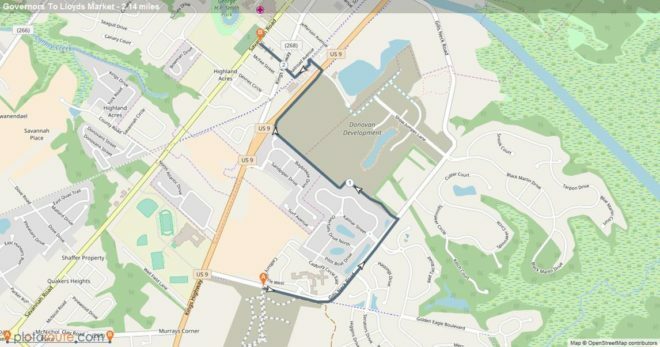 Now if you prefer to join Freeman Highway, you do have to cycle over a bridge but you’ll keep cycling straight and then bear right onto Cape Henlopen Drive. You have hit your destination and it was just over 3 miles! Now you can travel across to Cape May and cycle into town where more adventures await you! The ferry terminal is also a great location to visit throughout the year for its festivals, concerts and Winter Wonderfest. PLUS it has an amazing outside bar called On the Rocks, which is a pretty neat summer night location. You’re going to go here more than you think and not always for a ferry! Rest assured, there is always something going on in Lewes. Meet Sarah and Scott, who are not only new homeowners, but also newlyweds! They look forward to having a vacation home here in Lewes to unwind and enjoy this exciting time in their lives. Read on to learn more about Scott and Sarah, and let’s give them a friendly Governors welcome! Tell us a bit about yourselves and your current situation? We are newlyweds who knew each other in college and reconnected twenty years later. I’m a middle school disciplinarian and Scott is a county cop. 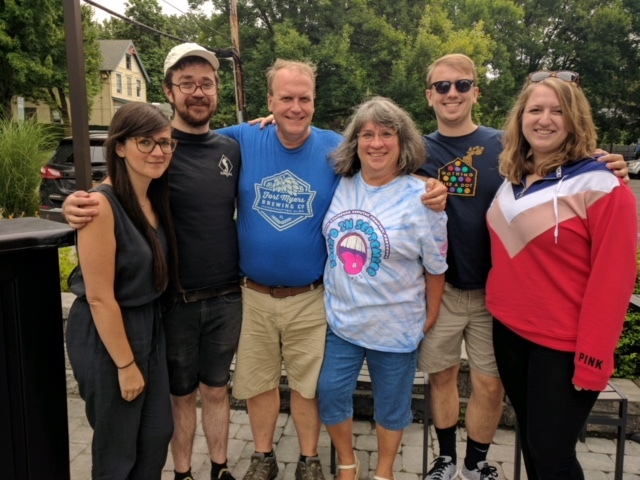 My family and I have been vacationing in Lewes for around 16 years now. We love the town of Lewes, and the neighborhood is located near the bike trail and pubs. We chose our floor plan because it has the master on the first floor. This will be our retirement home so we’d like to have easy access for when we get older. Summers at the beach and weekends the rest of the year. A place to go to rejuvenate and relax! Help us welcome Lenny and Patti to Governors! Retiring from their careers in Pittsburgh, PA, they are most excited to live life on vacation and sip cocktails by the pool with all of their new neighbors and friends. Find out what drew them to Lewes and to purchase a townhome in this awesome community! We are Lenny and Patti, and we live in Pittsburgh, PA! I retired from the Federal Government and currently work for the VA Hospital here in Pittsburgh. Patti works in healthcare with a medical group and plans to retire this July. We have been coming to the Rehoboth area for many years. We love this area, and decided to retire at the beach; but we felt there was not a lot to pick from in Rehoboth. 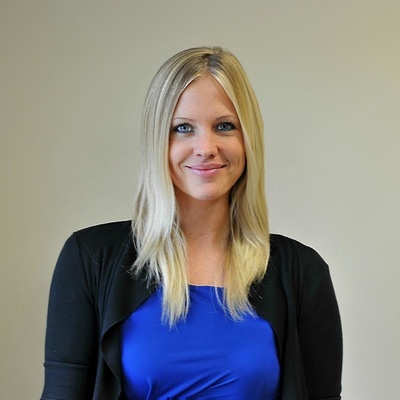 Our Re/Max agent Tiffany O’Malley recommended that we look at the Lewes area. The first place we went to was Governors, and knew we need not look further; we had found our future home! We love the town of Lewes plus the easy access to the beach. We like to walk and Governors will be perfect to walk to both. It seems like there is always something going on in town. We are also looking into biking, and our community will provide easy access for this too. We both enjoy relaxing pool side, and what a better place than at the Governors pool and rec hall/fitness center?! As you say, LOCATION is everything. Love the open concept and first floor main living area. Also for the quality of Schell Brothers homes and the many options. Getting on your bike is the answer at Governors. No more jumping in the car, it’s time to put those legs into action! Sometimes it’s to see the beach, other days it’s to visit downtown, or sometimes, like today, you might want to just to pop around the corner. Okay here is the scenario. You’re in your amazing gourmet kitchen and everything is beachy and shining. Then, you go to your Bosch french door refrigerator and realize that you have no milk! That happens right? Happens to me daily! Ha. So what do you do? Do you get in your car and get on Route 1 and go to Acme, Safeway, or Giant? Nope! Not when you live in Governors. You go where the locals go. Where you ask? Well, the amazing Lloyd’s Market on Savannah Road. Even better, by bike (using a majority of trail) you can get there in just 2 miles. Get your exercise and groceries all at once. Plus, what is outside your front door is pretty beautiful, right?! So jump on your bike, basket on the front…good for milk and growlers in my experience! We leave the community and turn right on the Junction & Breakwater Trail. Travel along the trail parallel to Gills Neck Road. Then you’ll need to cross the road at the crossing just after Hawkseye. Continue on the trail and pedal along the path parallel to Breakwater and then continue to bear right and draw parallel to Freeman Highway (US 9). You are then going to come off the trail and cross the Highway to Monroe Street. If you don’t want to do that, not that its really super busy, then you can carry on the trail and go under the bridge and come back up the start of the NEW Lewes-Georgetown Trail which brings you back to Monroe Street near the Lewes Library. You can then carry on the new trail and then turn right on Adams Avenue (on the left is the Margaret Rollins Community Center) and cross over Kings Highway to Manila Avenue. At the end of Manila you will find the oldest grocery store in Lewes, Lloyd’s Market. And of course you will find lots more to offer than just milk. My favorite, well I shouldn’t share really as I’ll be super upset if I go and they are all SOLD OUT, but to be honest this happens anyway. Okay, okay, it’s the Wonder Roast! Amazing rotisserie cooked chicken. Literally the chicken just drops off the bones. When you need a quick fix because you ruined the tacos, or overcooked the ribs, then my friends this is it. Dreamy. Actually, it’s making me hungry so I’m going to get mine early before the word spreads. Check out the route and check out Lloyd’s! Enjoy the journey and enjoy the ease of getting your groceries from a local store. Remember now, soon you’ll be a local too! Join us! Follow the map! My name is Suzanne. 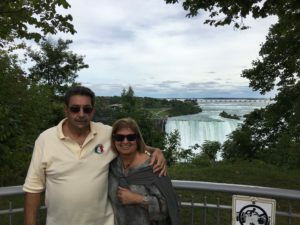 My husband, Larry, and I are looking at 2-3 years before retiring. We have been looking for roughly 2 years for a place to retire! Being near water is a must! We have 4 kids, ages 29, 28, 27, and 26. The 29 year old is engaged!!! We also have an ornery cat named Wall-e.
We had taken the Cape May-Lewes Ferry once. Then, as beer people, we decided to explore Dogfish Head. We decided to make the visit complete by staying at the Dog Fish Inn. Well, we fell in love!! After 2 years of looking in the Lewes area, the location is what convinced us to buy at Governors. We wanted first floor living. We look forward to beaches, Lewes, the pool and new neighbors! We found our way to Lewes Beach pretty easily, and now…Rehoboth! The best way to go to Rehoboth and ‘play tourist’ is to cycle the Junction & Breakwater Trail. Save the hustle and bustle of Route 1 for all people on their four-wheeled machines. When you live on Gills Neck Road, Route 1, becomes a distant nightmare and you only need the two wheels! So our location is set; let’s be a local and play tourist by going and doing whatever so many do on their vacation that we have the ability to do whenever we want… because we live here ALL THE TIME. Everyday is a vacation, right? Thrasher Fries or Kohr Bros. ice cream and jump on your bicycle. You peddle to the front of Governors and join the Junction & Breakwater Trail which is parallel to Gills Neck Road. Yep it’s right on your door step! You’ll keep on peddling through Senators (another Schell Brothers and Jack Lingo community) and then Hawkseye. At the end of Hawkseye, you’ll drop into the wooded section of the trail on the right. The Junction & Breakwater trail will take you all the way to Rehoboth. Upon entering Rehoboth you’ll turn left on Hebron Drive, then turn right onCanal Landing Road, then right again onto Church Street. Then you’ll hit traffic lights where you will be turning left onto the main drag, Rehoboth Avenue! From there it’s a straight road into town and the beach. The journey took us a little under 6 miles from Governors to the Rehoboth Boardwalk. Rehoboth has a number of bike stations you can stop at and lock your bike up too so no worries there. You have arrived! A little over 9km with amazing views throughout, less traffic, less road rage (other than the squirrels) and entering our sister beach without any worries or stress at all. Most importantly, you will not spend two hours looking for parking! More time to enjoy being a tourist. More rides at Funland. More time to go to Mug and Spoon and get an outrageous milkshake. More time to drop into Dogfish and try some samples. More time to soak up some sun and remember how lucky we are to live where we live. The people all around you will leave to go home, whereas you are lucky enough to come back any day you want and enjoy beach living and trail life! Join us! Just follow the map! 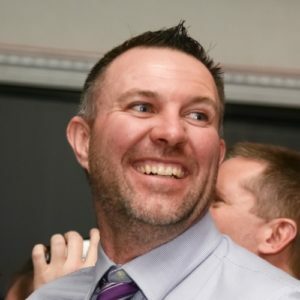 Get to Know Your Construction Manager! Oct. 12th, 2018 | Comments Off on Get to Know Your Construction Manager! In the sales office, Natalie and myself are obviously the face of Governors (always good to have such pretty faces), but now, we’re adding to our team! We’re just about to start construction on Causey Road in Governors, and I thought it would be a great idea – I know, I’m full of them – to interview the Construction Managers who will be building all these amazing town and single-family homes. Brad, pictured on the right, is a top chap. 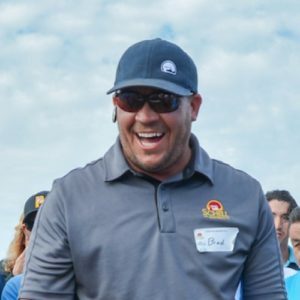 I have the utmost respect for Brad, who has completed some very large complexes for Schell Brothers and worked in our top communities (which is why he is coming to Governors). Closer to us he completed the amazing Beach Plum Dunes, which are rental condo buildings next to the Crooked Hammock, as well as being located in Bayside. I first met Brad in one of my first communities, Bayfront. 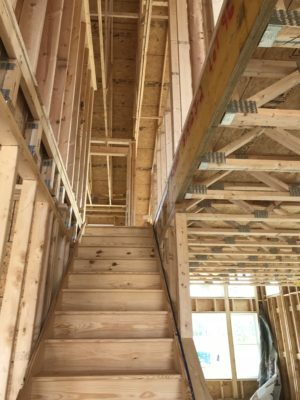 He has an amazing ability to coordinate contractors and keep everybody to a tight schedule, but also the knowledge and experience in building large buildings and our complex single-family floor plans. A cheeky chap, but extremely likable. His one son and wife keep him pretty busy, but Brad keeps a tight ship when he builds a house, and his communication is second to none. He is also a Piscean like me so he must be great;) He’s going to be awesome at Governors and we’re lucky to have him! Brian is a senior construction manager for Schell Brothers and is very well known for his personal attention to detail. Brian is already very well known on Gills Neck Road as he was a Construction Manager in our neighboring community, Senators. For me, it is once again great to be working with Brian as we both were recently heavily involved in creating Coastal Club across Route 1. He knows my process and I know his, so it should be a seamless transaction from design to build. Everybody raves about this chap and I’m one of his top fans. He creates amazing relationships with his homeowners and you always know where you stand with him and what to expect – perfection and nothing less. Brian is going to be awesome at Governors and we’re lucky to have him! Anyway, let’s get to know Brad and Brian better with some real questions that will give us proper insight into the new kids on the block! Q: If you could have dinner with anyone from history, who would it be, and why? Q: What would I find in your refrigerator? Q: List 3 words that describe your character. Q: If Hollywood made a movie about your life, whom would you like to see play the lead role as you? Brian: A combination of Flash, Superman, and Captain America. The ability to teleport would be nice too. Q: Top three bucket list items for 2018/2019? Q: Top places you recommend to eat and drink in the ’58? Brad: Striper Bites, The Buttery, Agave. Q: Worst habit you have? Posted in Uncategorized | Tagged construction manager, employees, Governors | Comments Off on Get to Know Your Construction Manager!